For the first report in the iSCAPE project Future Cities Catapult were tasked with understanding the challenges the six cities involved in the iSCAPE project were facing in relation to air quality and climate change. These cities include Bologna (IT), Bottrop (DE), Dublin (IRE), Guildford (UK), Hasselt (BE) and Vantaa (FI). Rather than focusing on technical issues of data gathering and experimentation, we aimed to uncover the social or cultural challenges the project might face along the way. To do this we conducted a survey of city stakeholders in each city, and analysed existing air pollution and citizen engagement initiatives. Sixteen challenges were identified and broken down into three key areas: urban environment, citizen perception and government policy. Although the iSCAPE project has a role to play in all three of these areas, it is likely that the citizen perception challenges are where the iSCAPE project and the living lab approach can have the most immediate impact. A living lab is when we take a collaborative, human centered approach to innovation, and experiment and test our ideas in a real-life setting. Some of the urban environment challenges are very difficult to solve through this living lab approach. For example, ‘the city’s location can make air pollution worse’, ‘the city is close to the airport’ and ‘innovating within a historic city can be difficult’ have clear physical and geographical hurdles to overcome. Similarly, government policy challenges such as a ‘lack of support from central government’ and a ‘lack of co-ordination among government bodies’ are big systemic issues that are a huge mission for the iSCAPE project to tackle alone. For real change to happen there needs to be both a bottom up as well as a top down approach. 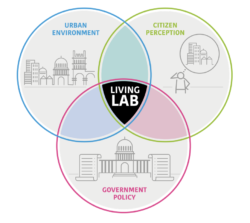 The iSCAPE living labs should play a role in facilitating discussions between citizens and government bodies to give people a voice in these issues. So, if changing citizens’ perceptions of air pollution is iSCAPE’s main mission, how can we do this in the most effective way? Firstly, we need to help citizens to better understand air quality and climate change as well as what they can do on an individual level to help with these issues. One of the most frequently mentioned challenges by stakeholders in all of our cities was that ‘the link between air quality and climate change is poorly understood’. In addition to this, many cities reported that ‘people have a very basic knowledge of the health impact of air pollution’, that ‘they have many misconceptions about good and bad behaviour in relation to air pollution’ and that ‘they don’t see air quality as something they can change’ on their own. Raising awareness of these issues is critical. Both cities and their citizens need to work together to develop new ways of thinking about these issues and people need to be made aware of how they can personally tackle pollution at the city scale. We also need to help make air pollution visible. The lack of understanding citizens have of the topic is made worse by the invisibility of air pollution, making it easy for both policy makers and citizens to forget about the problems it can cause both to the climate and individual health. Through the iSCAPE living labs we need to develop ways to make air pollution visible – this may be through thinking about new ways to tell compelling stories or creating impactful visualisations. This is an opportunity to be creative and engage citizens in the process. Using a human centred approach is likely to help citizens feel more empowered to change things. The iSCAPE living labs should use a human centred approach that aims to put citizens at the heart of designing potential solutions to these complex issues. We need to help them feel both listened to and empowered to make a difference to air quality through co-creation. This will help to solve some of the current challenges around citizens’ feelings that their actions are unlikely to make a difference. Make it Simple – This is not about dumbing down the topic but articulating the complexities of these issues in a clear, simple and easily digestible way. Make it Visible – We need to show the extent of pollution in the air. Visualise when the air pollution is particularly bad, and which neighbourhoods are most affected even when it is not visible. Make it Personal – We need to show people how these issues impact them on a personal level – what it does to our environment, our homes, our health and our children’s health. Make it Practical – We need to show people practical examples of what they can change in their everyday lives – from small to big behaviours. Make it Playful – This is not about playing down the seriousness of the topic but helping people to engage in the topic in a way that is fun, inspiring and encourages creativity in finding new solutions to these issues. Changing people’s perceptions and behaviour is never an easy task but this initial research has attempted to pave a foundation for the rest of the iSCAPE project by providing a basis for discussion and initial understanding of how some of the challenges identified could be solved through a human centred approach. By creating a set of principles for citizen engagement it also provides a framework for the iSCAPE living labs to communicate successfully with citizens, ultimately helping the project to have as big an impact as possible.